Sora is a older child of just over one hundred and thirty-seven(137.16) centimeters tall, and weighing in at just under thirty-two(31.7) kilograms. She has light blonde almost platinum blonde hair that falls just to the upper-middle part of her back. She keeps it tied in a ponytail that shortens the length to her shoulders(visually). She uses a black ribbon tied in a bow, to keep her hair in place. The ponytail appears to be messily put together as if she didn't care what she looked like. The rest of her hair lays flat on her head aside from one lock that sticks up. Her face is what one would call androgynous in appearance with slight leaning towards feminine. Her eyes are a light yellow that appears almost white or silver in color. All in all, she does not look like what an Uchiha would. She has tanned skin that's been smoothed out by constant travel in the desert. The sand that blows through the desert during storms forcibly smooths her skin out, even normal walking through the desert on a windy day, helps in the matter. Sora has near perfect skin, with only three blemishes on it. The first one, is a scar that runs from her right hip to her left waist, the second blemish is a mole on her right shoulder, and the last one is another scar that runs the opposite way on her back from her left hip to her right waist. The callouses that one would develop over time, have been smoothed away by the abrasive climate that Sora wanders aimlessly. Sora wears a short pure white sleeveless kimono with a light blue wrap underneath a black obi tied together with a pure white string. 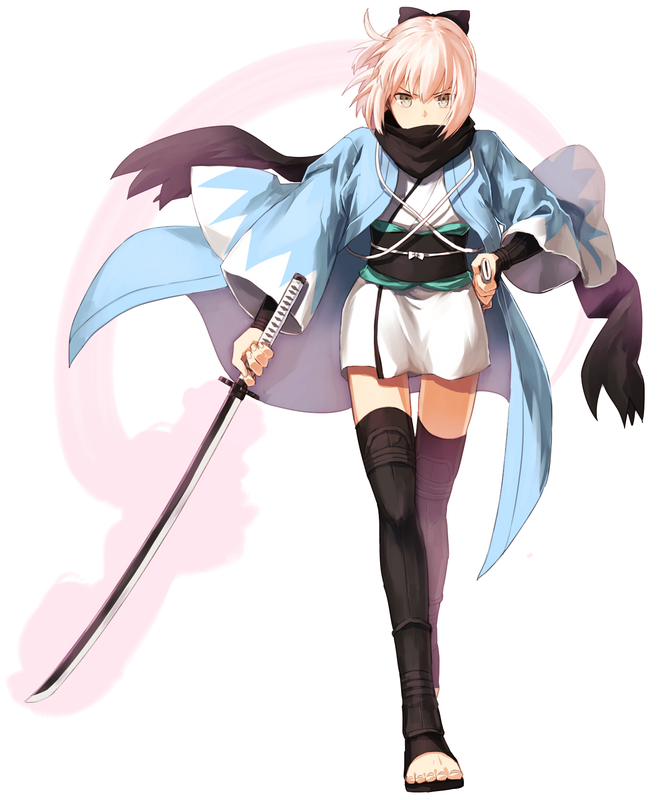 Above her kimono, she wears a sky blue haori with white triangles littering the bottoms of her sleeves. The haori goes down to mid calf, her kimono goes down to mid thigh. Underneath the kimono she wears a skin tight shirt with no sleeves. The shirt only covers her chest area, and part of her back. She wears a pair of tight short shorts underneath her kimono. Both of these underclothing are black in color. Sora wears a pair of thigh high sandals, without heels. Above the cloth of the sandals are a pair of lightweight highly flexible greaves that go up past her knees. She wears a pair of gauntlets made the same way as her greaves. She wears a long black scarf that covers her face and neck, she often wears it as a scarf or a hood. She keeps a pair of goggles underneath her scarf in case of sandstorm. Beliefs/Religion: She does not believe in any Gods. She believes however that someone can only rely on themselves in life and that asking for help from others is the hardest thing a person to do, because they risk being betrayed by the very people they have come to rely on. She prefers not to kneel on the ground and whisper into air for help and guidance, when she has her own two feet and hands to help herself and guide herself through life, getting help only when she absolutely requires it.